The Flow Distribution window shows the reponse time of transactions on the specified port. Primarily this is intended to check the performance of DNS servers and the port defaults to 53 for that reason. 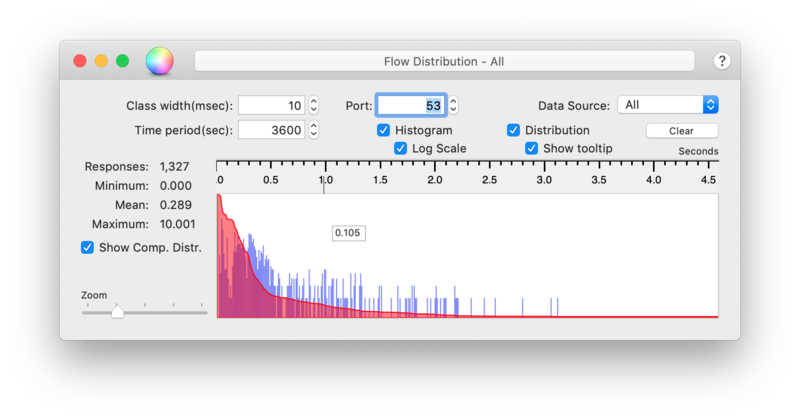 Flows that are captured by the Flow Monitor windows are relayed to the Flow Distribution window for analysis. i.e. You must have a Flow Monitor running. All time measurements displayed have units of Seconds. The graphs are scaled (either linear or logarithmically) to completely fill the display area of the window. Colour wheel Adjust colours of the Histogram and Distribution. Title Show the selected interface. Help Button Display this page. Select the interface that is to be monitored. All forwards flows from all interfaces to this window for analysis, otherwise only flows to/from the selected interface will be analysed. Responses are assigned to classes to form the histogram. The class width can have a dramatic effect on the appearance of the histogram and this value should be modified with care. The tcp/udp port that is monitored. You can monitor any port in the range 1 - 65535. See the note above re the DNS port (53). Captured flows will be expired after the time period has elapsed and this histogram updated to reflect the change. Display a histogram of all responses, classfied according the the Class Width value. Vertical scaling may be either logarithmic or linear. The histogram is scaled so that the maximum class value will be the height of the display. Distribution Display the cumulative distribution, scaled to fit the height of the display area. If checked, the Histogram is scaled logarithmically. This distorts the values visually, but enables greater detail to be viewed than is visible with a linear display. Discard all captured data and clear the display. Adjust the scale of the time axis.